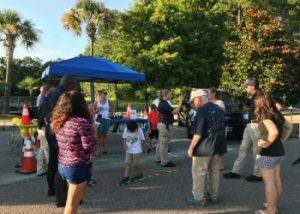 On August 7th, 2018, MADD SC attended National Night Out with the Mount Pleasant Police Department. National Night Out is a campaign that promotes healthy community partnerships with local law enforcement. Law enforcement meet with community members with the goal of making neighborhoods a safer place for the families living there. In addition, it provides a great opportunity to bring police and neighbors together under positive circumstances. There was a good community turnout for the event. The Mount Pleasant Police Department provided food, drinks, and music. They also performed K-9 demonstrations and the SWAT Team exhibited their equipment. This event is important for the department and for the community. By having MADD participate in events like this, it gives us a chance to teach the community about our programs and services.